Save the Date! Tuesday, April 12, 2016 is Ben & Jerry’s Free Cone Day with a FREE Ice Cream Cone to all from 12-8pm! No purchase is necessary to get this very delicious deal, just show up! For more information, please head here and to find a local Ben & Jerry’s near you, head here! 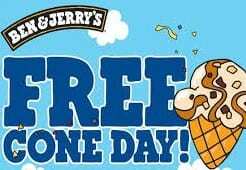 Will you be attending Free Cone Day at Ben & Jerry’s? Have you been in the past?